Modern day High Definition Television (HDTV) began in Japan in the 1980s and in US/Europe in 1990s, but didn’t really get traction there and globally until the beginning of decade. As recently as 2002, there were only 3-4 ‘HD’ channels available in U.S. and even those had fairly limited HD Programming. I was one of the early adopters of HD (HD Ready TV and Set-Top Box Service Provider) in US in 2003. American Football (NFL) was one of the first sports to start airing some games in High Definition. Fast forward to present, and dozens (if not 100s) of HD channels are now available in the US. The old analog over-air broadcast technology has been long out of favor, compared to digital broadcasts through cable and satellite providers. HDTV has to be seen to be believed! Quantitatively it has over 5 times the resolution of normal TV. Qualitatively, its amazing! Today in India, HDTV coverage is still in a very nascent stage and in this blog post, I will make an attempt to provide an overview of the core technology, HD Ready TVs & Production/Distribution Equipment (hardware), and last, but not the least TV Programming (content). Transitioning from regular TV to HDTV is almost like the quantum jump felt by people in India when we transitioned from Black & White to Color Television in the 1980s! Myopics can understand this analogy the best: Remember when you get a new pair of glasses that corrects the power of you vision by 1-2 – how things look exceedingly crisp and clear for the first few days! You suddenly realize the vision sharpness you were missing. Well… watching HDTV for the first time is that kind of experience. Suddenly you realize that green patch on the ground that you are seeing on the TV has distinct blades of grass..with dew drops. That huge stadium filled with blurry crowds are distinct faces…. That color complexion on a face is actually a freckle…that there is actually some small text written on that bottle in the kitchen.. that you couldn’t read before… I can go on and on with the examples..but I think you get the point! Unlike great progress made in areas like mobile phones, etc… India has been lagging the developed world in High Def TV. But there are some good signs of hope on the horizon. HDTV stands for ‘High Definition TV’. TV resolution is usually measured in ‘lines’ (only recently did the notion of ‘pixel’ arrive…). Over the past 8 decades, TV images have been ‘created’ by scanning an electron beam onto a phosphorus-like material coated screen, to create lines at a fast rate to create a ‘picture’. These traditional TVs are also referred to as ‘CRTs’ (Cathode Ray Tube). Note that the human eye has an ‘inertia’ for image processing and if an image projected on the screen (principle used in motion picture) or scanned lines on a TV screen, change with a frequency of greater than 0.1 sec, then we ‘see’ a ‘moving’ image. Traditional TV standards consist of pictures between 400-600 lines (Different Color Systems globally are a bit different: PAL that is used in India and in many EU countries uses 540 lines. NTSC used in North America uses 480 lines, etc.). Also note that in the 1930s, given the limitation of analog bandwidth and technology, a decision was made (that has stuck over all these years!) to go for a picture aspect ratio of 4:3. This was much ‘squarer’ than the 35 mm film aspect ratio in those days. HDTV changed the aspect ratio back to a more wide-angle movie like format to 16:9. The HDTV format has 1080 interspersed lines. (I will get into the 1080i vs 1080p discussion a bit later). With double the lines and greater ‘aspect ratio’ – the resolution of HDTV becomes much better than that of the conventional 480i(NTSC)/540i(PAL) 4:3 TV. In fact newer advances in HD (1080p, etc.) are realizing the dream of having motion picture level image quality on a TV Screen. As discussed earlier, in the old CRT TV set technology (540i for PAL, 480i for NTSC), lines were scanned by the electron beam. To reduce the bandwith requirement, a decision (again..many decades back) was made to scan the lines in an ‘interlaced’ fashion – in one pass only alternate lines are scanned 1-3-5…-537-539 and in the other pass 2-4-6…-538-540. This happens so fast that the viewer sees the full picture. But the resolution of this picture is approximately 1/2 of what it would have been if all the 540 lines were scanned simultaneously. The HD standard of 1080i lines implies that the twice the number of lines are scanned in an interlaced manner. A new scanning approach that evolved with HDTV was that of ‘Progressive Scanning’. Here, all the lines are scanned in the same pass. Thus roughly speaking, a 540p scanned image is analogous to a 1080i image. (In actual practice, 720p image looks quite close to a 1080i image – and hence true HD is defined as 720p/1080i or higher). The first HDTVs were CRTs with a 1080i format (progressive scanning is quite tough in a CRT approach…but much easier in a flat screen where pixels are being used instead of an electron beam). Early LCD and Plasma TVs (until a few years back) didn’t have the necessary pixel count (manufacturing complexities, etc.) to to have 1080 lines vertically. Hence they settled on the 720p HD standard. However in the past few years, 1080p TVs have become common. HD or non-HD TV Set? A few years back, this was a choice. Today (even in India) – there’s no choice! Almost all LCD/LED/Plasma/Projection/DLP TVs are HD Ready. Major companies have stopped making non-HD TVs (except in the sub 24inch CRT space…eventually these too would go away). In this section, I will provide a quick overview of the different HD TV Sets. CRT: The oldest technology format was used for HD in the 1990s and early 2000s. With a rear projection approach, the first big screen HD (and non-HD) TVs became a reality. However these are now virtually extinct. Plasma: Plasma TVs were the first big screen flat TVs to become popular 10 years back. Back then LCDs were not available in big sizes and also refreshed slowly. Plasmas had issues of burn-ins (static image getting burned in permanently onto the screen) and were very heavy (even though they were flat). While Plasma TVs have addressed these issues, they are getting replaced by LCDs. LCD: LCD (Liquid Crystal Display) TVs are today the most popular format for HDTVs. They have been able to address their earlier limitations of screen sizes and fast refresh rates, and contrast ratios. 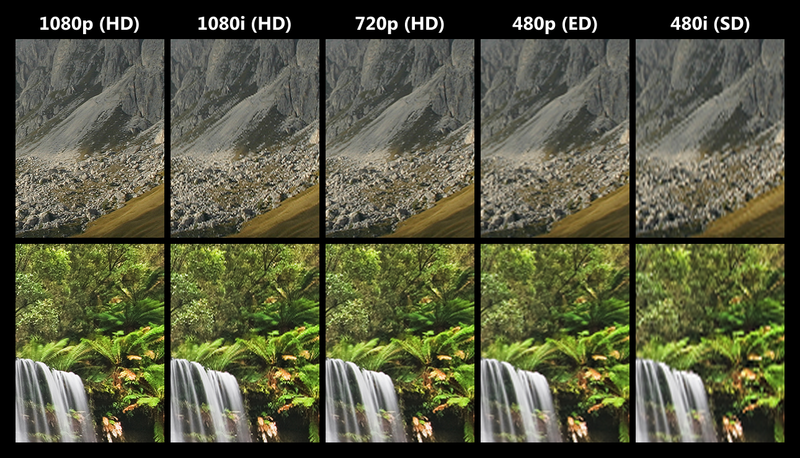 Now 1080p is quite common resolution available (1920X1080 pixels). LED: LED TVs represent the new exciting developments on top of LCD TVs – offering even brighter displays and contrast rations. With LED TVs – I doubt if there’s any rom left for Plasma TVs. DLP: The DLP technology and projection TV technology was developed by Texas Instruments earlier last decade. However, the rear projection screens are not flat and have lost out to LCDs/Plasmas. However DLP is still an excellent technology for HD Projection on big movie screens. In fact all digital motion pictures are being shown in some of the new Digital Theaters around the world using DLP Technology (No Film!). Just to complete the picture, almost all the modern DVD players are ‘progressive scan’. This means that they deliver an output of 480p or 540p – much better than the 480i/540i standard broadcasts. Like any new technology, the primary constraints now are economic. Just as when the switch happened from Black & White to Color, the TV Cameras, the Processing, Transmission and Receivers and TV Sets had to change..the same applies for HDTV. Creating HD Content needs different higher resolution cameras and transmission equipment. Luckily for us in India, just as non-HD TVs increasingly getting rare, same applies to the Cameras and Studio Equipment as well. A big standards battle was being waged for many years in the HD DVD segment. Toshiba led HD-DVD and Sony led Blu-Ray standards went to head to head. This race brought the memories of the VHS vs. BetaMax standards race for the Video-Tape in the 1980s. Eventually Sony Blu-Ray won and is now the established standard for High Def DVDs. As I had mentioned earlier, 35mm Motion Picture resolution is close to (in fact a bit higher) than HD as well..so in that sense, every movie is HD Ready Content. It just needs to be converted into a DVD Format. As explained earlier, just having a HD TV Set doesn’t buy you anything (well..maybe a little better picture clarity than non-HD TVs..but no where near the 5-10x improvement). Like any new technology, many satellite TV players were ‘planning’ HD Content in India for the past few years. As an HD enthusiast, I was following this with keen excitement. However it turns out that none of the big players – DishTV, TataSky, Airtel, etc. actually launched HD Content. SunTV became the first one to debut it recently. From the point of satellite / cable providers there are two implications. 1. They need to get HD Content (Chicken-And-Egg problem in India..HDTV not available, hence no good HD Content..). A good workaround option is to go with good international HD Channels that are already available: DiscoveryHD, National Geographic HD, etc. 2. They need to upgrade their processing equipment, satellite feeds and set-top boxes to support HDTV. Sun DTH (Direct-To-Home Satellite Provider) provides DiscoveryHD, National Geographic HD and a few other Indian HD Channels (Note – the Indian HD Channels still don’t have a lot of good HD Content..but atleast the vehicle is now there). The big catalyst for HDTV in India, in my view happened earlier this week when SunDTH announced that IPL Games will be available in HD! I believe with the popularity of Cricket in India – this can be the watershed event for HDTV in India. I think there’s no looking back. The big players of satellite TV will now have to scramble and get their plans in order..and fast! I think with the latest TV equipment (cameras,etc.) being used for coverage of IPL – they were anyways producing the content in HD. The HD feeds were available for international markets (US/EU/ec.) through local tie-ups. They just had to (I guess..) partner with a local player willing to have the set-top boxes to stream this content to India. As a big fan of HDTV, I would definitely thank the IPL and SunDTH for being the pioneers in finally getting HDTV to India!